Water usually gets into a home through cracks in foundation walls or the floor, or through the cove joint where the wall and floor meet. Interior waterproofing systems can take care of these leaks. 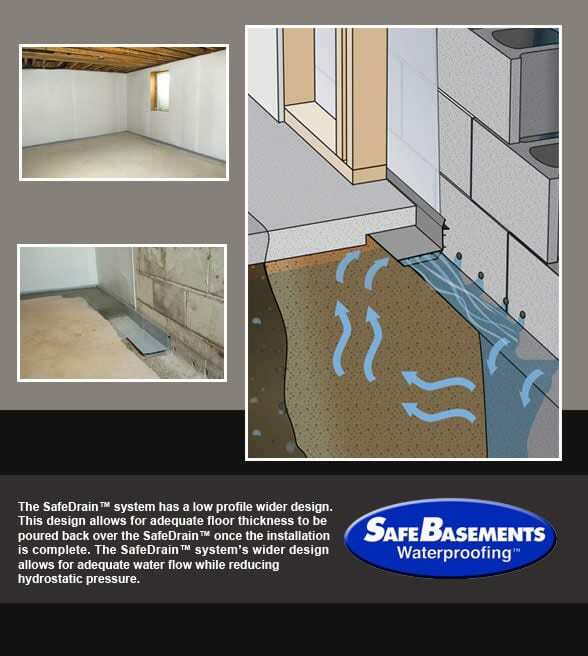 BDB Waterproofing uses the SafeBasements™ products because they are proven to be highly effective in removing water from basements and keeping them dry. SafeBasements™ Waterproofing systems are designed to work in conjunction with radon mitigation systems to make your basement a dry and healthy environment. The SafeEdge™ Waterproofing System components divert water that comes in at the cove joint, where the floors and walls meet. Water goes under the slab and into a drain tile system that is installed alongside the base of the foundation. Its patented design has a rubber seal on the back that presses against the wall. This seal prevents moisture and soil gasses, such as radon, from entering your home, making the air in your home cleaner and healthier. 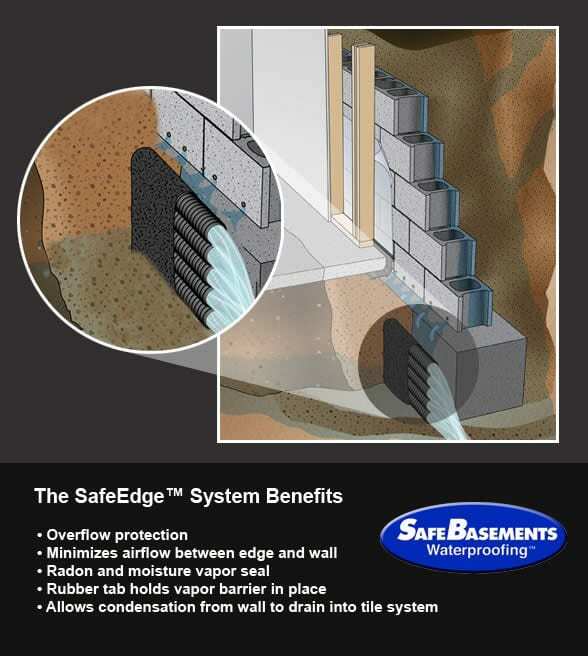 SafeEdge is available in two height configurations to accommodate a finished basement or an unfinished basement. The SafeDrain™ system has a low-profile, wider design. This design allows for adequate floor thickness (3.5 to 4 inches of concrete) to be poured back over the SafeDrain™ once the installation is complete. Other systems are taller and allow only 2 inches of concrete to be poured over them. This concrete is not thick enough to attack carpet tacking strips to it. The SafeDrain™ system’s wider design allows for adequate water flow while reducing hydrostatic pressure caused by poor soil conditions .